Dr. Allan Zavod DMus: Composer, Conductor, Arranger, Performer: World famous Jazz Solo Pianist. Zavod composed and performed the music for the stage production of Tolkien's The Hobbit. 1st Australian to attend Berklee College of Music, Boston, on Duke Ellington's recommendation, 1970. 1st Jazz Fusion Concerto on Australia Day for the Bicentenial at the Opera House performed by Australian Youth Orchestra in 1988. Won the Asia-Pacific Broadcasting Union (ABU) Song Contest in Kuala Lumpur (as composer), taking a very young singer Kate Ceberano on her first international performance, 1987. Awarded Doctor of Music by Melbourne University in recognition of his international achievements as a composer of Classical Jazz Fusion and for his substantial, original and distinguished contribution to music knowledge, 2009. Environmental Symphony, performed initially at The Banksia Environmental Awards in 2010. Later performed in full by the Melbourne Symphony Orchestra at Hamer Hall in 2015 - all proceeds (over $100,000.00) going to the Royal Melbourne Hospital for GBM Brain Cancer Research. An Inspirational live event, was performed in full for the first time on SUNDAY 20 DECEMBER, 2015. The Melbourne Symphony Orchestra performed this landmark concert at Hamer Hall, Arts Centre, Melbourne. Allan Zavod wrote "Resilient Spirit", an Oboe Concerto, for World Famous Oboe Soloist Diana Doherty. 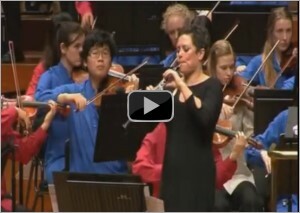 Diana performed with the Queensland Youth Symphony on 26th March, 2011. The Concert took place at the Queensland Performing Arts Centre, and was conducted by John Curro (AM MBE). Dedicated to the resilience of the People of Queensland during the 2011 floods. 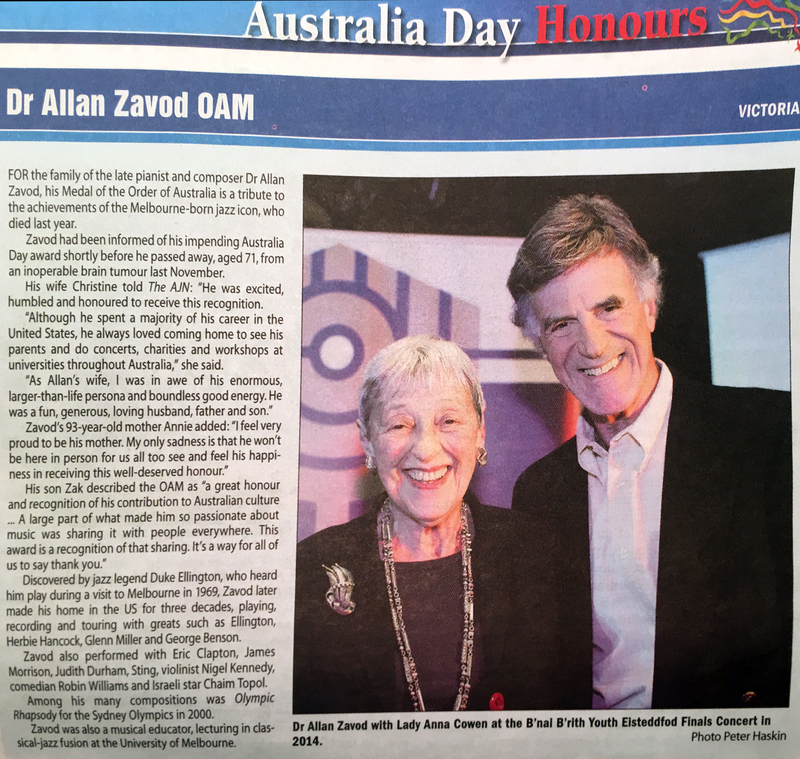 In 1988 the Australia Council commissioned Allan Zavod to compose "Concerto Australiana" for the Bicentennial Australia Day Celebrations. This Piano Concerto is a classical / jazz fusion three movement work for piano, orchestra and jazz ensemble. 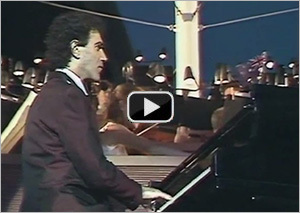 It was performed live on ABC television at the Sydney Opera House. In the second movement: "Andante", Soloist / Composer Allan Zavod performs with the Australian Youth Orchestra on live national broadcast ABC TV. It was released in association with ABC for audio recording and televised broadcast - World premiere. Click here to hear the first movenment: "Allegro ma non Troppo" and the third movement: "Allegro". 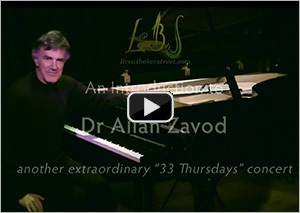 In this clip, Dr Zavod plays a sampling of what he performed at his extraordinary "33 Thursday" Concert. You can hear him play his own original composition: "Flying Willow", also a little bit of jazz, and some classic-jazz fussion. His performance was held in a very intimate, softly lit setting in a classy mini concert room, where you can sip wine and listen to live music. At L@BS, performances are actual "recording sessions" that participants get to view live. The DVD of this performance is coming out soon. 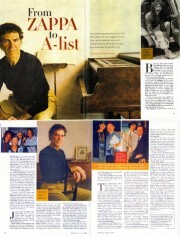 Allan Zavod has played with the Greats: From Zappa to A-List (Sunday Life Magazine - Sunday Age). Since then Allan has played with Frank Zappa, George Benson, James Morrison, as well as just jamming at the Comedy Store in LA with Robin Williams. So Zavod has been a rock star, but he's also worked with many of the world's greatest jazz performers. Now he composes for symphony orchestras, with a twist. A hairpin bend away from life on the road playing acid jazz with violinist Jean-Luc Ponty and touring with Zappa, Zavod is now at the forefront of composing a brand-new style - jazz classical fusion. From 2005-2007 Zavod was living in America. From 2007-2012 he was devoted entirely to composing in Melbourne. During this period his orchestral works were performed here and overseas. For a list of his specific works, visit About Allan: Zavod in Depth, and Biography. 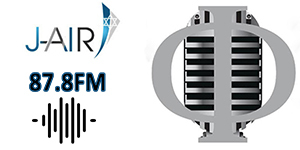 For past performances you can visit our Multi-Media page to see some clips of a wide variety of genre. From Classical to Rock to Jazz Fusion. Zavod finally got back to playing the piano after his 7 year hiatus composing full time. From 2012-2016, he performed at several gigs in and around Melbourne, including: Cafe Latte (Hawksburn Village, Toorak); Marquee Lounge Bar (Trak Centre in Toorak Village); Ruby's Music Room (Little Londsdale St). Allan also performed at several very special events overseas, including: Live @ Phnom Penh; Viet Nam National Symphony and Orchestra; Sax N Art Jazz Club (Ho Chi Minh City/Saigon); Dawn Service aboard the AZAMARA Journey on the Gallipoli-2015 cruise for Anzac Day centennial commemorations. Visit our Current Events page to find out about some of his more recent performances. 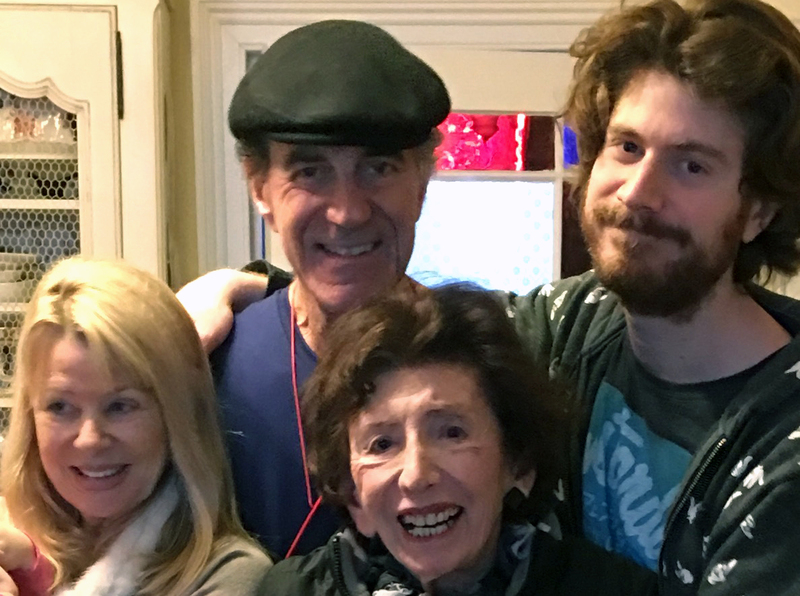 He was diagnosed with Terminal Stage IV Inoperable Glioblastoma Multiforme (GBM) Malignant Brain Tumor in July 2015, and was only given 3 months to live. During the following 17 months, Allan continued to do what he loved best: perform. His last live public performances were in September -just 2 months before he died. The late Dr. Allan Zavod's final public performances on Sept 14 & 28, 2016 at the Marquee Lounge Bar in Toorak: "Its about time" - CD launch, dinner and show. 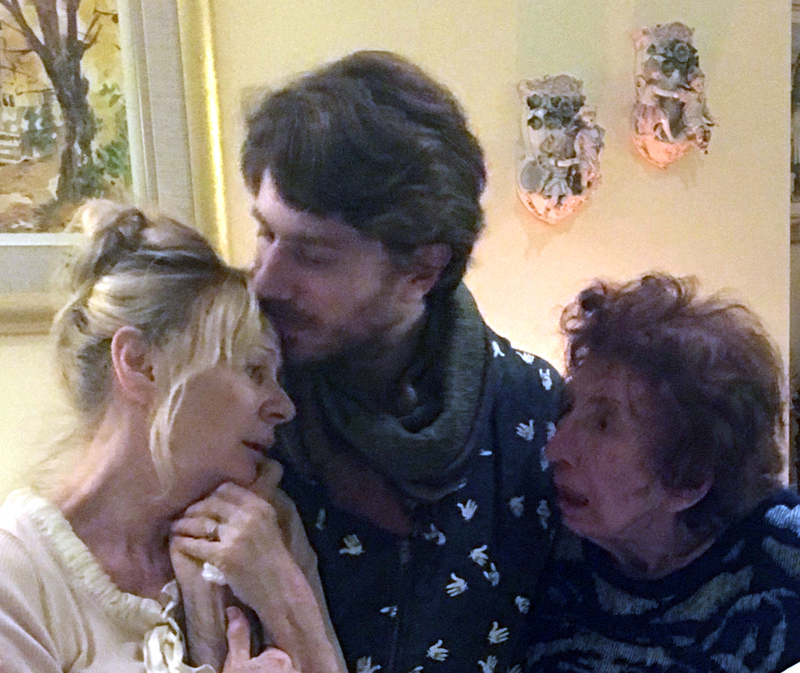 Part of the proceeds from the nights went to the Zavod fellowship for Brain Cancer Research. Dr Allan Zavod being interviewed on the The Mix (ABC News) - 22nd October 2016. Just one month before Allan passed away (Nov 28th) after a 17 month battle with brain cancer. Allan Zavod Performing for the Australian Jazz Bell Awards at Birds Basement, 2016. Zak Zavod leads this one-hour tribute to his late father, Allan Zavod, with bassists John Lee and Jeremy Alsop, hosted by J-AIR station manager Robert Bontschek. Rest in Peace, Allan. You will be sorely missed.